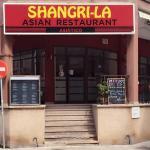 Description: Best Asian restaurant in s arenal!We have chinise food,tai curry and India curry.Every day have Day menú. brilliant place to have a beer and watch the sunset as well as the world go by..not just for touists,locals also drink here,so it must be good. Not trendy but food was good. Didn't know what to expect but fancied Chinese so we left our all incl, to dine here and food was actually very good but the waiters can't speak English and that made it hilarious. Had a meal here as a couple last week for our 1st wedding anniversary. Meal was very tasty. Would definitely go back to restaurant just not to resort. Been to Shangrila Asia Restaurant? Share your experiences!